American University President Sylvia M. Burwell has announced the launch of the Sine Institute of Policy and Politics. Capitalizing on AU’s location in the nation’s capital, the Institute will bring together experts and top scholars in the field with students in research and scholarship to work on the nation’s most pressing challenges in a way that promotes common ground and bipartisan policy solutions. A laboratory for university-wide collaboration and an incubator for policy innovations, the Sine Institute will convene leaders from the public, private and nonprofit sectors and journalism to foster an exchange of ideas and engage in research around the complex drivers shaping policy and political discourse. The Institute is supported by a gift of $10 million from AU alumnus, trustee and entrepreneur Jeff Sine and Samira Sine, a journalist and advocate for women and children. Their gift is the manifestation of their interest in making positive change that will inspire future generations of leaders. The Institute launched Tuesday with a conversation between Burwell and U.S. Sen. Bob Corker, R-Tenn., at the Newseum. 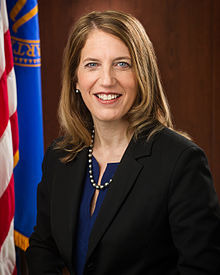 “We aim to raise the quality and impact of the study and practice of policy and politics, as we bring together professionals at the top of their fields, scholars and students,” said Burwell, former Department of Health and Human Services Secretary. Six initial members of the Institute’s advisory board were announced: Michèle Flournoy, CEO of WestExec and former under-secretary of defense for policy; Danielle C. Gray, senior vice president, chief legal officer, and corporate secretary for Blue Cross and Blue Shield of North Carolina and former assistant to the president and cabinet secretary in the Obama administration; Anita McBride, executive-in-residence at AU’s School of Public Affairs and former assistant to President George W. Bush; Deval Patrick, managing director at Bain Capital’s Double Impact business and former Massachusetts governor; Frances Townsend, national security analyst on CBS News and former assistant to the president for homeland security and counterterrorism; and Dr. Philip Zelikow, professor of governance and history at the University of Virginia and former counselor of the U.S. State Department.